After spending years providing four-star meals to adventurous diners, a master chef decided to leave the toque behind to pursue his own journey. Not to discover the savory tastes of French cuisine, but rather to try to discover the feelings of serenity and healing. Man has set forth on such Journeys since the beginning of time – pilgrimages to Mecca, rites of passage into the wilderness on walkabouts and missions to uncover spiritual guidance through vision quests. But Gourmet Chef Ara Gureghian’s journey is a little different. After losing his 26-year-old son, Lance, six years ago to a long battle with cancer, Ara was left heartbroken and empty. Two years after trying to find solid ground and acceptance, Ara decided to venture on his own quest to seek understanding, healing and maybe even rediscover the meaning of life. Like Ara, Spirit has overcome emptiness and emotional damage. 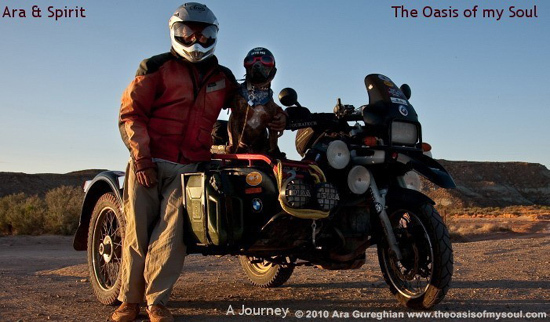 But unlike other traditional solidarity-seeking Journeys that subscribe to a certain faith, or an ancestral passageway, or personal discovery through fasting, Ara’s voyage involves a motorcycle, a sidecar and a pit bull on the long and ever-winding road. A world traveler and transcontinental nomad since childhood, before emigrating to the United States, Ara trekked through Europe, the Middle East and Africa. Shortly after graduating from “the best culinary school in Switzerland,” his father handed him a one-way ticket to Philadelphia. He was America-bound, with adventures and opportunities awaiting him. Ara vividly recalls his visit to the shelter that fateful day he met his newest best friend in life. It was one year after his son’s death. What would he name him? “There was no hesitation calling him Spirit,” Ara said with a strong certainty. Like Ara, Spirit has overcome emptiness and emotional damage. Even worse, he was physically abused with water from a fire hydrant, the strong pressure beating him down in body and in spirit. 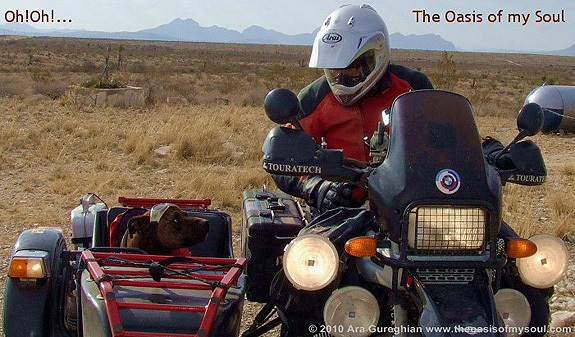 After building their bond and going for a test drive together in Old Faithful – Ara’s motorcycle – Ara decided that he and Spirit were ready. 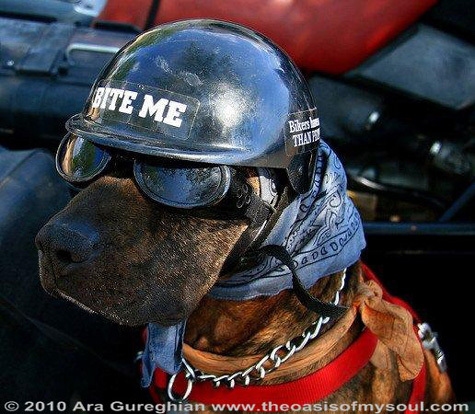 “He jumped in the sidecar, and I put his red goggles on, and that was it,” Ara said very matter-of-fact. “And he’s very important in the sidecar, OK? He knows it, especially if he’s got his helmet on, he’ll pose for the photos,” he added with a soft chuckle. Ara sought advice from pit bull forums about his decision to hit the road on his bike with his pit bull in the sidecar and only $1,000 in his pocket, what he had left after spending his life savings in the fight for his son’s life. But Ara and Spirit proved them wrong. Spirit is clearly more than a sidekick in a motorcycle sidecar. In fact, Spirit is about to be officially crowned a therapy dog, a specific type of service dog. The tags are on their way. On pit bull discrimination, Ara says he has been pleasantly surprised by the feedback he has received while on the road. Ara’s take on misconception of the breed is two-fold. For one, people lack common sense, and secondly, “a dog is a dog is a dog,” he said. People must be responsible pet owners and not take risks, Ara continued. For example, dogs need to be on a leash in certain situations. While there is no clear “finish line” to this journey in plain sight, Ara’s compass is a spiritual one, with a true Spirit helping lead the way. With 140,000 miles in four years behind them, and Spirit’s philosophy of safety first when riding, which includes sporting a fashionable helmet, goggles, coats, heated blankets and more, this team is ready to take on the road untraveled. With over 550 chapters detailing his journey thus far published onto his exceedingly popular website (and now a movie in the pipeline), Ara’s sense of freedom – from routine schedules, the slavery of technology and time – is felt deeply and sincerely in the heart and soul. “There is my buddy Spirit always ready to clown, his locking eyes into mine quietly talking of constant affection never diminished wherever we are and whenever as a constant state of mind. His coat (is) always warm on the cold days heating my hands themselves when frozen shut. His head is tucked into my armpit with so often a big sigh, yes, we are together, we are one. There is his unconditional Love lifting my Heart when so often needed only by a look and a hug.